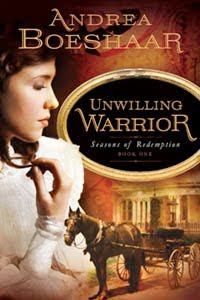 Amid the dangers of the Civil War, Valerie Fontaine longs to know she is loved and safe. Her father, however, is cold and withdrawn. And their Christian houseguest, the photographer Benjamin McCabe, seems arrogant and judgmental. When Valerie commits her own life to Christ she finds herself drawn to Ben. But her father, against her wishes, is prepared to sell her into a loveless marriage with someone else. Will Valerie be forced to abandon her newfound love? Or will she and Ben, against the backdrop of this country's most ruthless war, become in their own way, unwilling warriors? Andrea Kuhn Boeshaar has been writing stories and poems since she was a little girl and has published articles and devotionals as well as 31 novels and novellas. In addition to her writing, Andrea is a certified Christian life coach and speaks at writers’ conferences and for women’s groups. She has taught workshops at such conferences as: Write-To-Publish; American Christian Fiction Writers (ACFW); Oregon Christian Writers Conference; Mount Hermon Writers Conference and many local writers conferences. Another of Andrea’s accomplishments is co-founder of the American Christian Fiction Writers (ACFW) organization. For many years she served on both its Advisory Board and as its CEO. walkway, forming puddles in low-lying areas. Above, the heavens seemed to mourn in tearful shades of gray. her, given that it was their first Christmas without Mama. as he poured himself another scotch. His third. “Yes, so you’ve stated. But isn’t it obvious why I came home? dampness had a way of seeping into her bones. She shivered. standing in society if anyone found out about his . . . weakness. Did neighbors and friends already know? “What plans?” Curious, Valerie tipped her head. her black dress, she gathered the muslin in clenched fists of frustration. most holidays, like this one, time constraints restricted travel. and her reasons to leave boarding school ran deep. She lifted her fingertips to her temples as a headache formed. which was frequently of late. well as in New Orleans’s society. Or at least that’s the way she had remembered him. Valerie sighed when he rose to pour another drink. His fourth. How she wished she could hide that scotch bottle! “We’re having a houseguest tonight,” he said. “What?” Her jaw slacked at the surprising news. rarely spoken of Mama since her death. telegram was signed Mrs. Vincent Dupont, the doctor’s wife. ill. He hadn’t been able to reach Mama in time to help her. time it wouldn’t fall on deaf ears. But Father drained his glass and poured another. Number five. errant tear and squared her shoulders. “Where are you going?” Stunned, Valerie strode toward him. belongings. He donned his winter coat. this is a fine mess.” She folded her arms. “I know you will.” Valerie smiled at the good-natured woman. across the room and slipped one arm around Valerie’s shoulders. Valerie sighed, remembering some of Father’s former houseguests. rebelliously escaped and curled around her face. they turned a rosy pink. Valerie whirled from the full-length mirror in a swish of silk. “We’ll make a new batch soon,” she said. Adalia replied with a remorseful bob of her gray-blonde head. check her reflection one last time. laugh together with chatter of balls and beaus and fashion. Would it be the same when they saw each other again tonight? stretched out before her in grim uncertainty. Cast thy burden upon the Lord, and he shall sustain thee . . .
of joy would return to her life. pull up in front of the house. his head, usually unruly, were combed neatly back. her hand in greeting, and he took it at once. remark on her gown or the style of her hair. cider in spite of the fact he hinted at something stronger. creatures at her and laughed when she screamed in terror. and James seemed to have transformed into a gentleman. “What’s this?” He stepped forward, frowning his displeasure. down the hallway. He must have entered through the back way. skin. Rain dripped from the wide brim hat. what she’d received from James. He gave a backward nod. “I trust it will be safe in the stables. view of the man standing there in the dim, candlelit entryway.